A couple of weeks ago, the hockey team tried to grab some dessert a Breka Bakery at a relatively early hour. Well, the place was packed and that plan fizzled before it even started. We decided to hightail it out of there because we had already eaten at Sawasdee Thai. It wasn't imperative that we have dessert. Somewhere I can imagine Mijune sheding a tear... 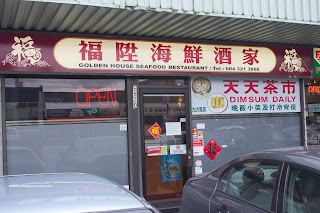 While I was walking out the door, I spied with my little eyes (and they are little), a tiny Chinese restaurant advertising daily Dim Sum service. Really... I was intrigued. Further to this, LotusRapper reminded me of this place in the comment section of the Golden Harvest post. Okay, I just h ad to try the place out. But with who? Ah yes, Rich Guy, the ever-so-willing dining companion that I have suddenly taken for granted since he has moved back. In actuality, I kinda guilted him into it since he needed my help replacing the fog lights on his Bimmer. By the way, can they make it any harder to replace those bulbs??? I digress. So when I thought the place was small, it was shockingly small on the inside. There was about 8 tables only for the whole place. 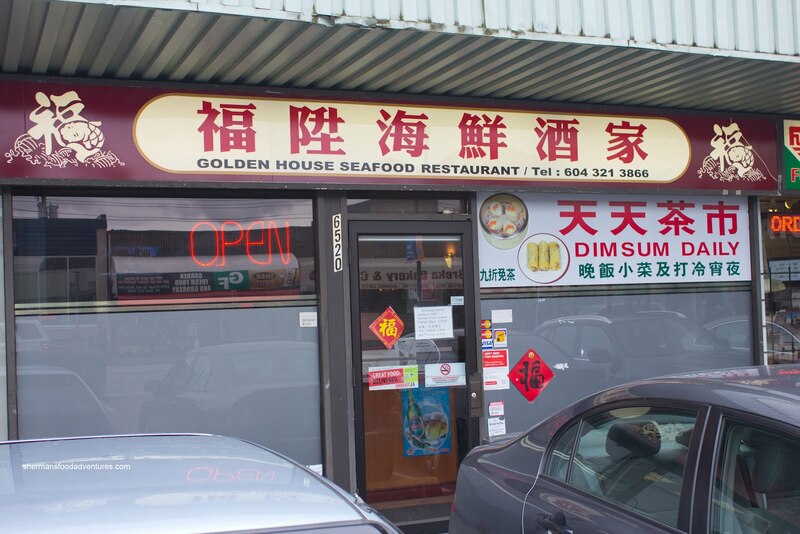 So what kind of Dim Sum could such a small place serve? Well, we were about to find out. The first thing that showed up at our table was the Preserved Egg & Salted Pork Congee. It was really thick and had a home-style feel. We didn't find it particularly salty nor was it laced with too much MSG. 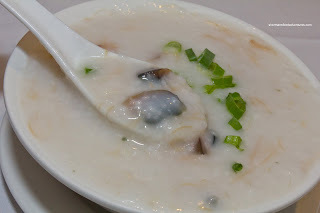 Yet, it wasn't bland either since we could taste the pork that had been cooked in the congee. What we didn't like was the aggressively shredded salted pork. It was so shredded, it was more like meat floss than anything else. Furthermore, the meat was hard and chewy. If the congee was mild-tasting, then the Shrimp Mousse Stuffed Eggplant was a flavour explosion. Normally, I complain about bland black bean sauces. Not here. It was garlicky and just salty enough to accent the eggplant. 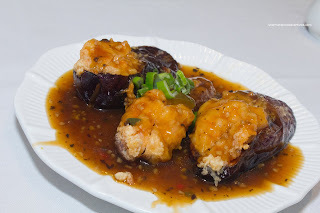 As for the eggplant, it was moist and crispy on the outside. The shrimp, on the other hand, was mostly crispy since there wasn't really a whole lot of it. When the Haw Gow arrived, it looked pretty legit. 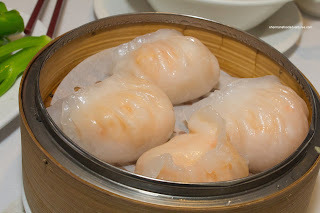 They were big and the shrimp filling was peaking through the translucent rice flour wrapper. Considering where we were eating these, the haw gow were impressive. Inside the nicely textured dumpling skin lay a good mix of whole shrimp and shrimp mousse. It displayed plenty of the bounce and snap we look for in haw gow filling. If I had to nitpick, the filling was probably seasoned too aggressively and the mousse was a tad soft. The Sui Mai were equally good. They too were large and texturally sound. The pork was marinated properly exhibiting a good bounce while still having a bite. The meat was juicy and flavourful from the seasoning and shiitake mushroom. One thing we would've liked to see was more shrimp. 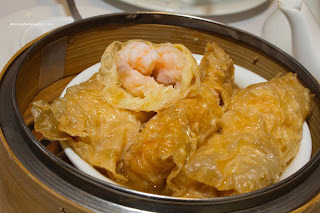 Well, shrimp was not a problem in the Bean Curd Skin Rolls because that was the ma in ingredient for the filling. The perfectly cooked shrimp had a snap which really changed the makeup of this usually heavy item. It was lighter than the all-pork version and we easily ate it all. We also liked how the bean curd skin was not too soft nor too tough. Okay, for no reason other than the limited selection, we got the Xiao Long Bao. 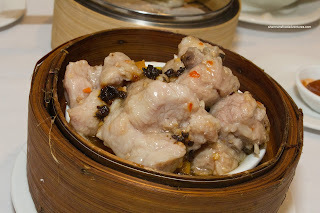 Yes, I know it is a Shanghainese dish served in a Cantonese restaurant. So therefore, we did not expect XLBs, rather we would've been happy with decent pork dumplings. 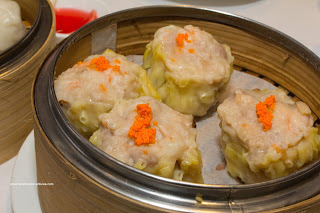 And they were more or less, okay pork dumplings. The skin was thick and doughy, however, the filling was actually quite tasty with lots of meat flavour and a good hit of ginger. It was moist and not-gritty either. 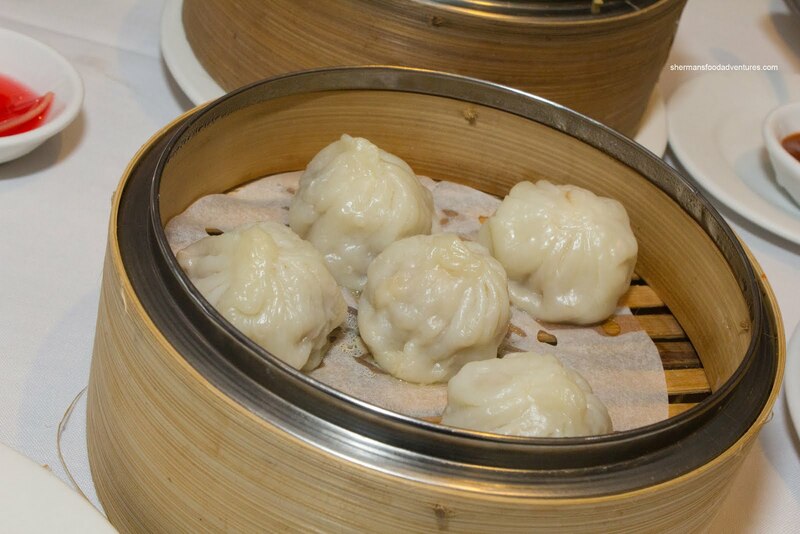 It just wasn't an XLB. Last but not least, we had the Black Bean Spareribs, which were not bad. The dish consisted mostly of meat pieces (the rib ends) rather than ribs. They were properly tenderized so it wasn't difficult to chew. In fact, they were mostly soft with only the rib pieces having a chew. There was no absence of flavour here with lots of garlic and black bean with a touch of spice. Overall, not including the XLBs (and really, I'm not holding anything against them), the Dim Sum at this little place was surprisingly good. Not exactly the cheapest, but with the level of execution and quality, we would be willing to do a return visit. How much are dishes there? @J-Free I believe they were in between $3 - $4.